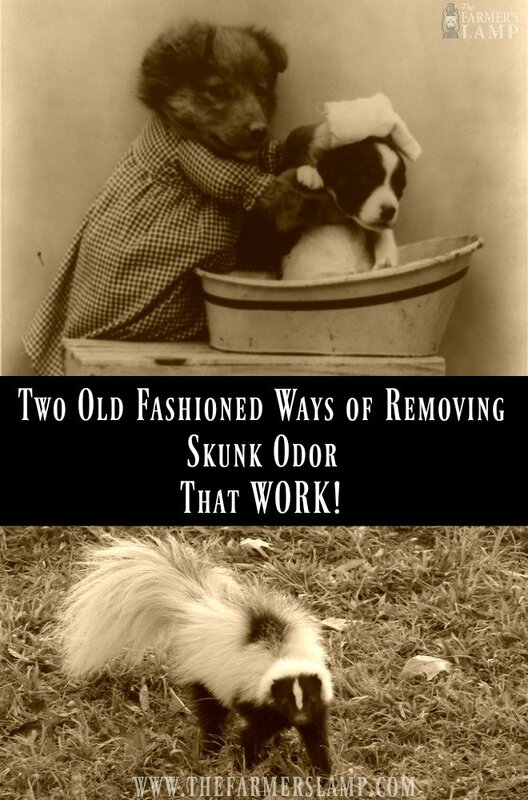 Two Old Fashioned Ways of Removing Skunk Odor-That WORK! It’s winter which means your local skunk families have moved in closer to food supplies. These include your chicken coop, sheds, and barn. With these stinky creatures so close, it’s only a matter of time before the family dog gets sprayed or worse yet, the person who startles them. You can skip the tomato juice, I have two old fashioned ways of removing skunk odor that work! I don’t know how many times I’ve seen skunks just leaving the chicken yard or barn as I was going out to do chores in the early morning. I’m always careful to give them plenty of escape space, however, the dogs just don’t seem to see the same value in this as I do! Many years ago, we had a chocolate lab named Buddy. Bless his heart, he loved everything and everybody. We often found him loving up and protecting fawns, calves, and rabbits. He even tried to love a skunk…once. He saw it leaving the barn and went to check it out. Maybe he thought it was a cat? Anyway, he did his best “let’s be friends” routine only to be rewarded with stinky stanky skunk spray. Since Buddy slept indoors, waiting for the stinky stank to wear off was not an option. We immediately went for our family go-to for skunk odor removal. Raw, organic apple cider vinegar is a standard on our homestead for all kinds of things. This was the first time in many, many years it was needed to remove skunk odor. We were glad we always have large amounts on hand for just such an emergency. Yes, it was an emergency for us! You can use straight ACV as long as you rinse your dog well immediately. Be aware ACV may burn sensitive skin. If your dog has this problem, then you should use a dilution of 2 parts water to one part ACV. Be careful around the face because it will burn their eyes and noses. Before we touched the dog, we made sure we had on clothes we didn’t mind getting icky. They can be soaked in white vinegar or ACV for a few hours then washed in hot water to remove the skunk odor. You may have to soak them more than once depending on how strong the oils from the spray are. Throwing them away is always a quick option as well. Wet your dog thoroughly with water then pour on ACV or the ACV dilution. Massage it through the hair to saturate its coat and skin. Let it sit on the dog for at least 5 minutes before rinsing well. If the dog was close enough for the oils to be extremely concentrated in the spray, you may have to repeat a second time. I like to learn everything I can from old-timers, sit and sip coffee all day while they share their experiences with me. I was doing just this with one of my favorites, Mr. Ted, when I shared with him about Buddy’s skunk episode. He shared how his family removed the skunk odor. Again, be sure you don’t mind about your clothes. Wet your dog thoroughly with water then apply the mixture. Massage to saturate to the coat and skin. Let it sit for at least 5 minutes and rinse well. If the oils are strongly concentrated, you may have to repeat. As with ACV, be careful of the face. This solution has to be mixed just before you use it. Both of these “recipes” will work for removing skunk odor from people and clothing as well. I’ve never been sprayed and hope to never be. IF I were to be so unfortunate, I’m glad I know at least two effective ways of removing skunk odor. I’m sure you’ve heard of using tomato juice or lemon juice. These don’t work. Tomato juice may be slightly effective, but it would take several soakings to be thoroughly rid of the odor. That’s a lot of tomato juice to soak a dog’s coat several times, not to mention covering a human body several times. 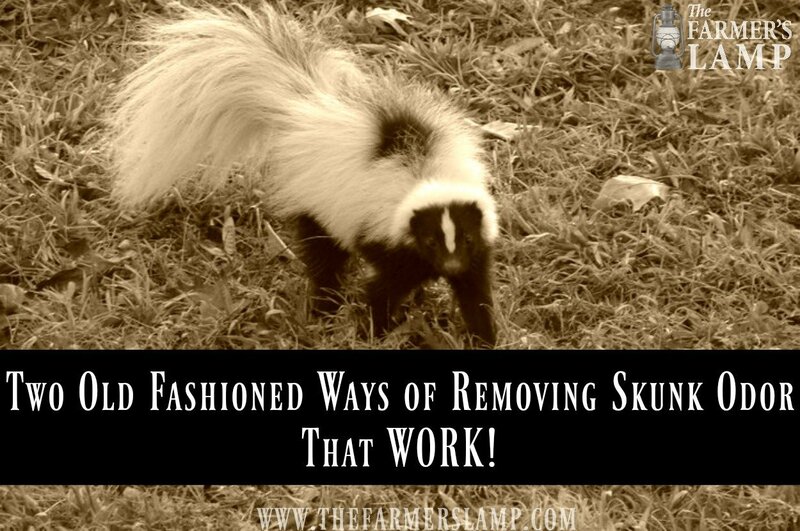 While I hope you never have cause to need either of these two effective ways of removing skunk odor, at least you’ll be prepared. Who knows, maybe you’ll need it just to help out a neighbor! Have you or your dog been sprayed and used something else that worked? Please share your experience with us.